"Crowley approaches her subject through a rich mix of methods. She undertakes a careful analysis of government documents that address the shift in family structure and the changing laws shaping child custody and child support collection and enforcement. But, most interesting is her rich cache of interviews covering 26 groups across the country. These interviews, partially transcribed and spread liberally throughout the text, help to convey confidence in the close familiarity with the fathers’ rights groups that she has managed to achieve...As a study which adeptly combines careful scholarship with an explicitly evaluative and even prescriptive agenda, Defiant Dads: Fathers’ Rights Activists in America is impressively successful." 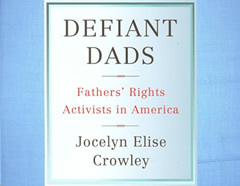 "Defiant Dads is perhaps the most comprehensive text ever written about fathers’ rights groups. Never before have we been able to figure out just how prevalent they are, which groups are typical or extreme, or how and whether their activism really works. Previously established as a leading scholar of these groups, Crowley places them in a much larger context by discussing how they came about, what their actual membership looks like, and how they obtain a following. She also addresses what their existence means for the men and women involved, their relationships with their children and former spouses, and for feminist and gender politics more generally...For anyone interested in fathers’ rights groups, this is a must read." "Crowley (public policy, Rutgers Univ.) has written a thorough, evenhanded account of the fathers' rights movement in the United States. To her credit, she conducted in-depth interviews with participants in these groups and observed them in action, as well as reviewed research studies. After reciting the history of such groups, the author analyzes their structure from a sociological perspective. In succeeding chapters, discussing child support laws, custody rules, and post-divorce family dynamics, she marshals statistics and anecdotes to address points made by fathers' rights advocates. While critical of the groups' political goals, which call for less state involvement in custody and child support, she defends their personal goal of more involvement by fathers with their children. For a more polemical and pro-fathers' rights account, compare Taken into Custody: The War Against Fathers, Marriage and the Family by Stephen Baskerville. For specialized collections." "For fathers who struggle with the child support and custody laws of this country, and those interested in this topic, Jocelyn Elise Crowley has written an informative and sympathetic book, especially helpful for divorced fathers who think they have to face the burden alone. While the book provides a history of this movement, the most helpful parts are the chapters on group meetings and other occasions where information is given on how to deal with the situation. Any father finding that he isn’t alone in this battle must be encouraged. 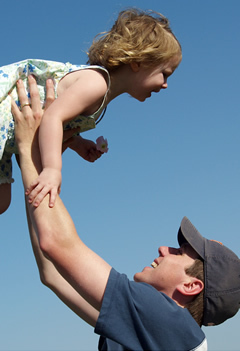 Even while offering helpful information, the author and others see little chance of the fathers attaining their biggest goal: lowering their child support payments and obtaining automatic joint custody of their children. Most cases are settled in favor of the mothers, presumably for the welfare of the children, which many men say is not the case. Even with this prediction, fathers need to read this book. Not only do they have the support of other fathers in the same situation, the book also offers information on dealing with the mother and the children. This is a timely book on a phenomenon that makes for unhealthy relationships in our society." Selected as an Outstanding Academic Title: Crowley (Rutgers Univ.) has written an important, theoretically rich book that empirically examines the father's rights movement and engages a wide range of scholarship, including scholarship on family law and policy, feminism, social movements, and ideology and public policy. In examining the movement, she finds important positive aspects, such as its emphasis on responsible fatherhood, but she also notes the pervasive antifeminist and neoconservative-influenced antistatism of the movement. These are barriers to the movement's growth and effectiveness. Crowley importantly notes the problems with completely neutral approaches to issues of equality, particularly in the context of the movement's call for 50-50 arrangements in child custody and child support. This, of course, ignores the difficulties and burdens that mothers still face in the workforce, especially with continued child care expectations and employment discrimination. As a result, Crowley is rightly skeptical of the policy agenda of the movement for ignoring these continuing realities. Also interesting is the insight that the movement is still a genuine grassroots movement, having avoided the professionalization and elite dominance common to so many contemporary social movements. Summing Up: Highly recommended. General readers, upper-division undergraduate students, and above.